Managing your money affairs is not just about making smart investment decisions. Becoming smart consumer is equally, if not more, important. So, today let’s learn a thing or two about some malpractices of pharmaceutical companies. For a moment, just imagine Reliance Fresh start selling potatoes under its own brand, say, ULOOS at a price of, Rs 80 per Kg and Spencer starts selling them at Rs 50 per kg under its brand LOOLOOS while SAFAL price is Rs 20 per kg and sabzi mandi price is just Rs 10 per kg. Are you going to buy them from Reliance or Spencer? Of course, not! You’re intelligent enough to be wary of such marketing tricks. You know quite well that fancy packaging can’t better the quality of an Aaloo. Let’s change the picture and replace vegetables by medicines. Isn’t it amazing that those branded LOOLOOS and ULOOS are the most popular and most sold drugs in India? Did you know that big pharma companies in association with doctors (so-called most venerable profession) and chemist shops make a big fool of consumers? D0 you know the following facts about medicines sold in India? 1. There are different brands of the same medicine available in the market. 2. The brand name instead of the generic name is more prominently displayed on the medicine. 3. There is wild variation in prices (100%, 200% or even more than 1000% i.e., 10 times) of these different brands without there being any difference in quality. 4. The most selling brand of a medicine is usually the most expensive one. 5. 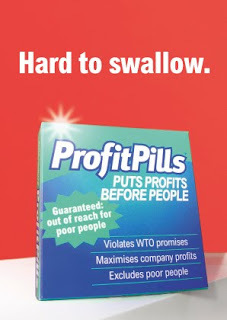 Big pharma companies directly or indirectly bribe doctors to sell their higher priced branded medicines. 6. The pharma companies supply generic versions of the same medicines to the government at very low price (in some cases the retail market price is more than 50 or 100 times the government procurement price). 7. Unlike their western counterparts, doctors in India prescribe branded medicines instead of the generic version. 8. The medicine (brand) prescribed by doctors is usually the costliest brand. The most shocking observation, in fact, is not just the availability of these exorbitantly priced medicines but people openly buying them without even knowing it. Why is it so? Actually, medicines are the only product where purchase decision is not under our direct control. The decision is made by the doctor on our behalf. Ethics demand that recommended drug should either be a generic name or lowest price brand if there’s no difference in quality. But the fact is otherwise. Isn’t it a total breach of faith by the community of doctors whom we consider next to god and trust blindly? Medicine is not the same as aloo. Medicine is critical, aloo is not. Hence your analogy is flawed though your point is right. Dear Fisher I first Appretiate your concern for Poor unfordable patients of India. Allow me Answer your concern (perceived as Facts). >>>>> Yes - why? read this "amoxicillin + clavulanate potassium" or AUGUMENTIN Which one is easier??????? 3. There is wild variation in prices (100%,.....) of these different brands without there being any difference in quality. >>>>> Yes - Price Varies. How did you know the Quality are the same. Drugs should be effective and safe. At times Cheaper drugs work the other way causing severe side effect, which may not be in Original drug. >>>>> Yes they are. Because they work the way which it should be. Are you not ready to pay full price for Your Vehicle Break Shoes. >>>>> Who said Big pharma Cos. alone do, this shameful act it is also done by Small pharma cos too, to get their share. Doctors are also to be blamed for Accepting the "BRIBES" directly. Why should you recomend a branded Shirt to you friend, when you are getting a soft drink free from the promoter. Doctors (not all) do that, which unrelated to their profession. This issue is taken by Medical council of India and a regulation has been framed. >>>>> No industry survives on Charity. All needs money to survive the future. Pharma Industry is not a exception. Pharma people will be happy if Government pay the full price, as a result the overall price including private hospital can be reduced. The loss somewhere is compensated somewhere. Pharma company has to move forward bring new drugs for new disease. You and me sitting before this blog can write an article, but can we discover a vaccine?!?!?! >>>>> IN most Western Countries, Medical Bill is Payed by Government as their citizens are covered by Govt medical Insurence. So Government Decides the brand not the Doctor. In India, Sadly most patient or his/her family members pay the bill. So the Doctor has the choice to choose the brand. Also please keep we have to in Mind that, no doctor would like to Priscribe a bad drug to his patient, becasue it not only affects the patient life, indirectly it also affects Doctor's career and reputation. >>>>> Doctors prescribe high priced brand becaue, high priced brands are perceived(even by me and you) to be good quality. Good Quality products are costly in real life (Sony,Nike,Ray-ban...). If medicines are costly, it indrictly presurize the Company to sell its highest quality product. Ultimately the buyer gets the confidence of using the best medicine, Which i am sure a Cheaper brand cannot offer (chinese made Digital camera, platform sold slippers or sunglases). >>>>> Though I work for pharma company, I do not want to see people suffering just because I have to sell my product. I always wish those patient to take the best medicine to get releived from their suffering. It was nice to read the other side of the story by Partho.